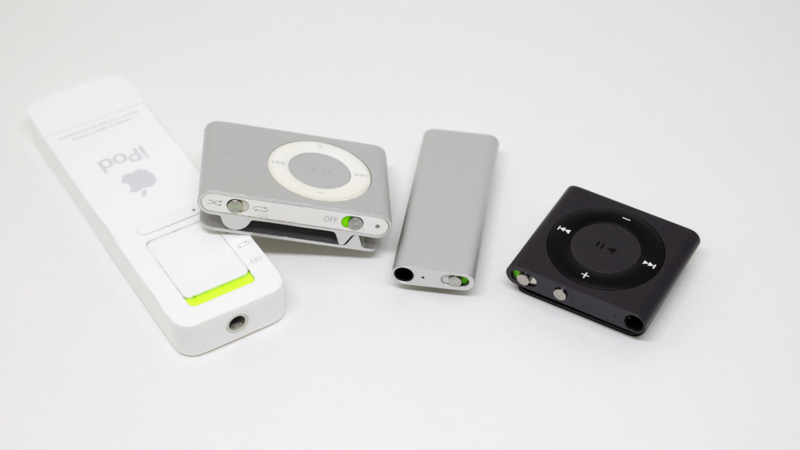 The tiny iPod shuffle was introduced as a “One More Thing” back in 2005 at the same Macworld where the Mac mini showed up. It was designed to push further into the low-end market than the iPod mini had done, but that’s a story for another time. The first Shuffle was built like a glorified USB thumb drive. This new player was smaller than a pack of chewing gum, and built around the concept of shuffling your music. There was no need for a screen or a true clickwheel. If you wanted to listen to music in order, the switch on the back could be set to continuous playback. iTunes could even autofill the device’s 512MB or 1GB of flash storage from music in your library. The second-generation Shuffle was a big departure for the tiny device. The first generation sold 10 million units, and 2006’s model capitalized on what made the first one great. As you can see, it’s much smaller. The real trick was that this iPod shuffle was a wearable. Gone was the lanyard; in its place, a simple clip. To reduce the size, Apple ditched the USB plug, replacing it with a Dock that synced data via the headphone port. In 2009, Apple revamped the Shuffle again, but I think they went too far. The company ditched the physical controls, relying instead on in-line controls on the built-in earbuds. Apple also bundled VoiceOver, allowing the iPod to read out information about what’s playing and giving users the ability to choose between playlists. This device didn’t go over well. It was confusing to use, leading Apple to publish a 4-minute video tour walking users through the controls and features. Thankfully, logic won out, and the current iPod shuffle is more or less a smaller version of the 2nd-gen model. VoiceOver is still on board, but the familiar ring of buttons is back. Unlike a lot of Apple products I talk about, the Shuffle is still around. $49 will get you a 2GB player in a range of six colors. It’s been for sale for 6 years without a revision, but if you’re looking for something to work out with or take on a run and don’t want to take your phone, it’s hard to beat something that weighs less than half an ounce.